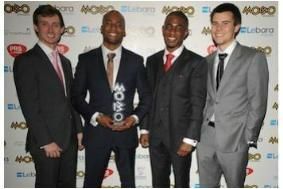 Naim Label jazz act Empirical wins a MOBO | What Hi-Fi? In the Awards, held last week in Liverpool, Empirical added the title to its BBC Jazz Awards Best Ensemble, MOJO Jazz Album of the Year and Jazzwise Album of the Year. And the completion of their second album, Out'n'In, which is now available on the Naim Label, was made possible by another win – the Musician's Benevolent Fund's Peter Whittingham Award, which is designed to support up and coming jazz performers. Described by their label as 'British post-bop pin-up boys', the band – Tom Farmer (bass), Shaney Forbes (drums), Nathaniel Facey (alto sax) and Lewis Wright (vibraphone) – will be playing in London on November 16th as part of the London Jazz Festival.